Domestic & Commercial Pest Management Islington N | Quality Property Care Ltd. If you have a problem with pests, Quality Property Care Ltd. is the right pest removal service in Islington N for you. Working in the entire Greater London area, we can guarantee safe results each time you hire us. We have a lot of expertise and can remove any unwanted infestation from your residential or commercial property. We completely understand how desperately you want to forget about bed bugs, mice and dust mites forever. 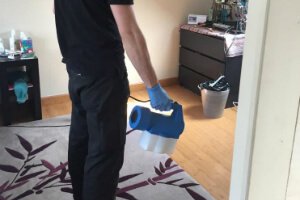 Our professional pest control service Islington N provides full approach into dealing with pests with our basic steps: inspection, treatment and prevention. Bees, unlike wasps, are useful not only in nature but in farming. For this reason it is against the law to exterminate bees. Quality Property Care Ltd. go the extra step and preserve the bees. To do that we call a local beekeeper who comes and removes, if possible, the entire nest. He relocates it in its own bee hive on a place that is safer for both people and pests. Quality Property Care Ltd. provides a full range of domestic and commercial pest control services in Islington N. They include flying and crawling insect inspections and treatment, as well as stopping the entrance ways, trapping and removal of rodents and other unwanted creatures. The pest professionals are certified by pest control agency and have passed courses for safe and efficient use of various insecticides, traps, baits and pesticides. We offer a one off pest control service as well as a guaranteed one, which includes 2 follow up free visits by pest control inspector. The services we deliver are: treatment, prevention and inspection of pest infestations. You don't have to live in this dangerous environment anymore! You can get rid of the pests safe and fast. Just call 020 3746 4287 and talk with our consultants. Tell us what you need and we will arrange a professional pest control service in the most convenient time for you!